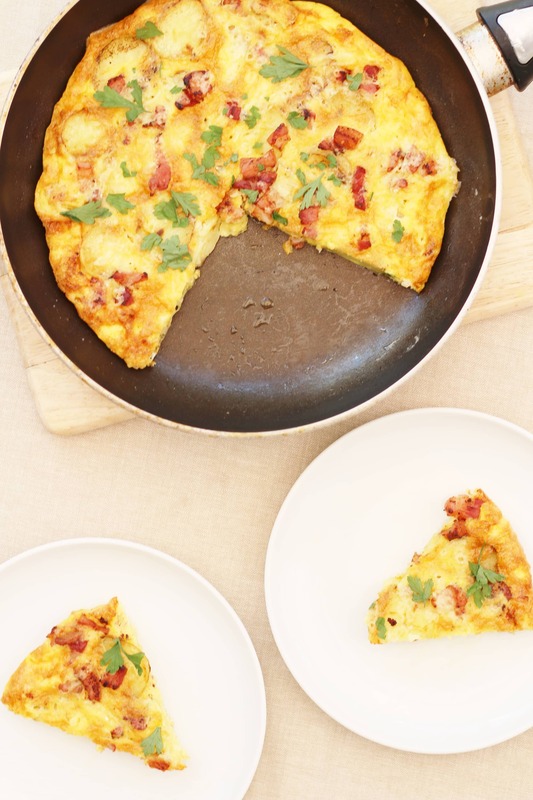 A simple breakfast or light lunch dish, this delicious frittata is inspired by the flavours of a Quiche Lorraine but without the added complication of pastry. 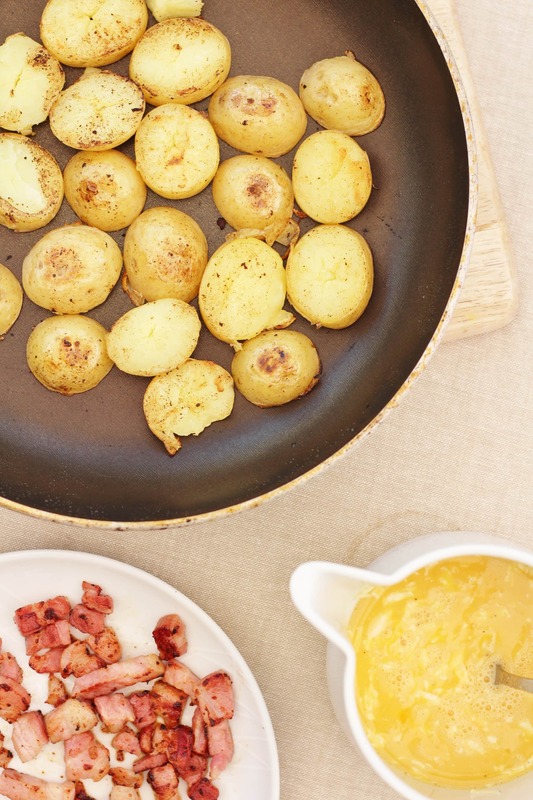 A great dish to make if you want to use up leftover new potatoes or bacon, or to make when the cupboards are nearly bare and you are just down to just a few basics! I was recently sent a bag of British Gems to try. 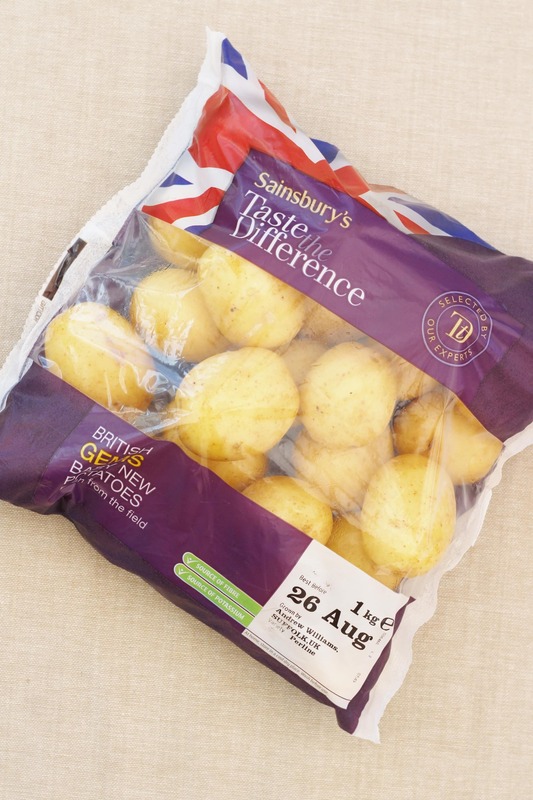 British Gems are baby new potatoes, exclusively grown in the UK (my bag came from Suffolk). They are harvested and delivered to stores in under 48 hours, meaning they are always super fresh. They are very tasty potatoes and have a lovely melt in the mouth texture. I was impressed with how quickly they cooked too – only 15 minutes of gentle simmering (I sometimes find new potatoes need a lot longer than this!). They are exclusive to the Sainsbury’s Taste the Difference range and currently cost £1.50 for 1kg. As these little potatoes have such a lovely flavour, there is no need to do anything with them more complicated than boil or steam them and add a small blob of butter or a drizzle of good olive oil and maybe a sprinkling of herbs. However, if you want to jazz them up they would be great in a curry, or turned into bombay potatoes or even roasted in the oven or as part of a delicious traybake! However, I decided to make a frittata with mine. 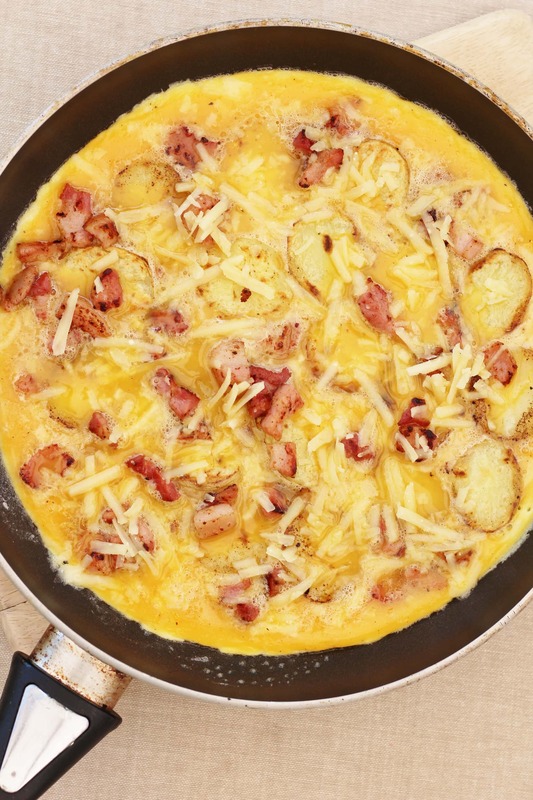 To make this spanish-style omelette you do need to boil or steam the potatoes first, which does add a bit of extra time…so why not plan this in for the day after you serve boiled new potatoes as a simple accompaniment and make extra, so you already have some cooked new potatoes ready and raring to go? A great way to love your leftovers! 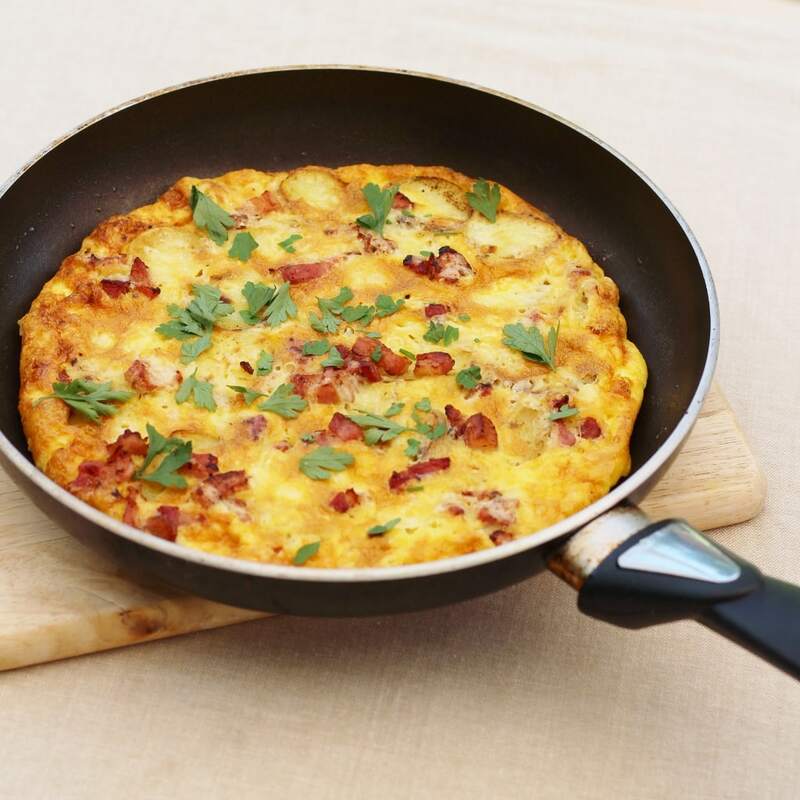 The flavours of this frittata were inspired by a recent trip to M&S where the kids and I did the Dreaded School Uniform Shop – actually it wasn’t that bad (well, apart from the paying part!). I try to make buying school uniform as fun as possible. I get the kids to try on all their old stuff at home first and see what doesn’t fit – we always have a bit of a giggle as something is always way too small. Then we drive down to M&S – my absolute favourite school uniform shop – reasonably calm, good value for money and I know it will last (my daughter, who is going into year 3, still has skirts that I bought for her reception year!). Once we’ve bought all the stuff, we hit the café! My kids (and I) absolutely adore the M&S café so this is always a bit of a treat for us all. One of my favourite dishes on the menu is their Quiche Lorraine and that is the dish that inspired this frittata. I love all the flavours in a Quiche Lorraine, but I don’t usually have time to make a quiche at home – all that chilling and blind baking brings me out in cold sweats! So when I got this little parcel of potatoes (and an accompanying recipe for a different kind of frittata), I began to wonder if I could create those wonderful Quiche Lorraine flavours in frittata form instead…and the answer is yes! Even better, making a frittata is so much quicker and easier than making a quiche. I had this frittata done and dusted in less than half an hour – and that’s including cooking the potatoes first! Quiche Lorraine is the traditional quiche flavour and originates from the Lorraine region of France. Lorraine is situated next to Alsace in the north east of France and borders Belgium, Luxembourg and Germany. Purists argue that the only flavours you should find in a Quiche Lorraine are a custard, made of eggs and milk, and lardons (small chunks of smoked bacon). However these days it is very common to find cheese or onions in it too. Potatoes are not usually found in a Quiche Lorraine but I wanted to use my British Gems and I thought they would make a good alternative to the pastry. 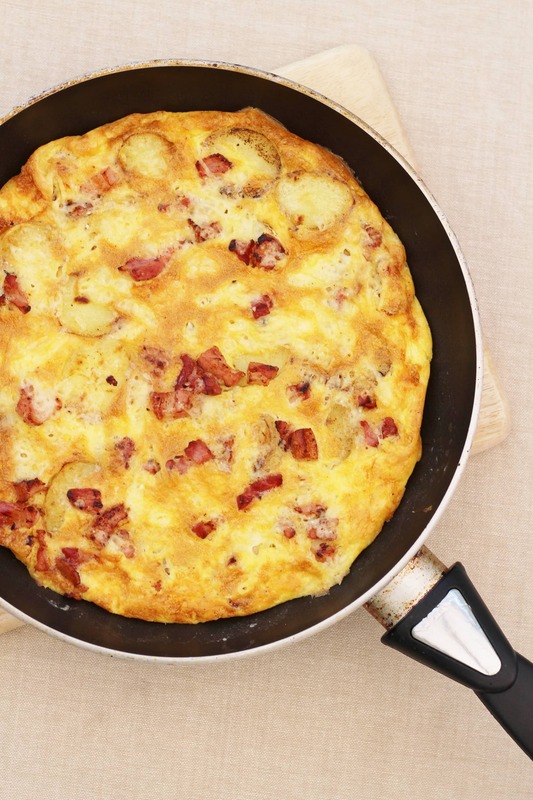 I have kept the ingredient list for this frittata super simple: apart from the potatoes and eggs, I have just added a small pack of lardons and a little mature cheddar cheese – though if you wanted to make this a little more French, you could use gruyere instead of cheddar. 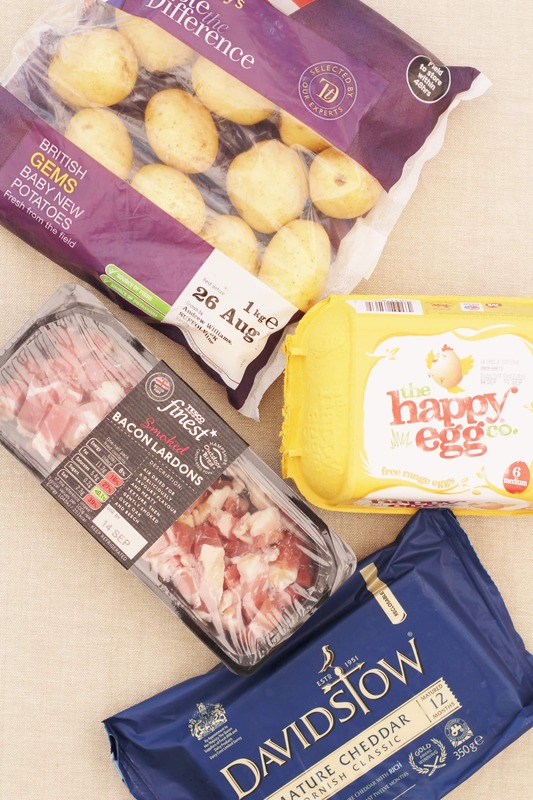 If you don’t have lardons you could definitely use chopped up smoked bacon…though I can really recommend these lovely Tesco Finest Lardons that I used in my frittata – so much easier than chopping the bacon up yourself and, in my opinion a much better shape for things like this! Plus they have a delicious smoky flavour. To serve, this would be very good with a side salad – and for the full M&S Quiche Lorraine experience you need a small green salad, a few tomatoes and a blob of coleslaw, but as my kids were at home…and my little boy in particular loves baked beans, the kids had baked beans, while I had a portion of my Quick Beany Chilli that I had leftover. And if you want to know if it tasted good or not? 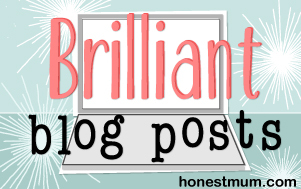 My little boy said…’this is actually quite nice!’ – which is high praise from a 6 year old! 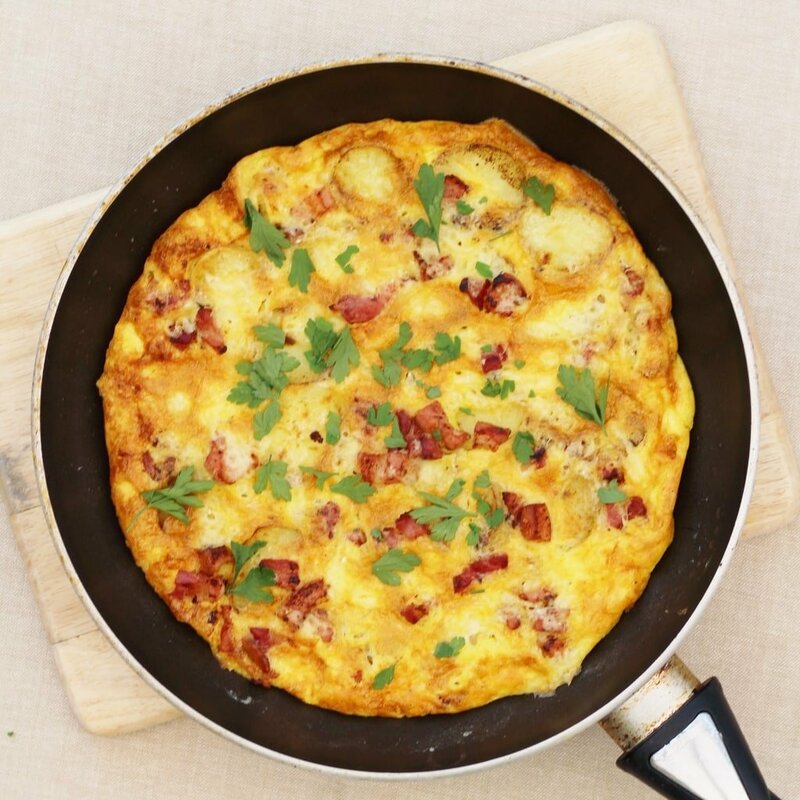 A simple breakfast or light lunch dish, this delicious frittata is inspired by the flavours of a Quiche Lorraine but without the added complication of pastry. A great dish to make if you want to use up leftover new potatoes or bacon or to make when the cupboards are nearly bare and you are just down to a few basics! Start by cooking the whole new potatoes in boiling water for 15 minutes – until they are just done. Drain and then chop into thick slices. Meanwhile fry up the lardons in a non-stick frying pan over a high heat for 2 to 3 minutes until golden. Tip out onto a plate but don’t wash up the pan yet! Next crack all the eggs into a jug, add half the cheese and some salt and pepper and mix together thoroughly with a fork. Put the frying pan back on the heat and add the sliced potato – cook for 2-3 minutes on each side until golden. Tip onto a plate. Now give the frying pan a quick wash and dry, then put it back over a medium heat and melt a small knob of butter. When the butter is foaming, turn the heat down and add the eggs. Set a timer for 5 minutes. While the egg is cooking in the pan, place the potato slices on top of the egg (some may sink – don’t worry that’s fine) and then scatter the lardons on top. Finally scatter over the remaining cheese. Next turn your grill up to high and when the timer goes, pop the frittata under the grill to brown – this should take about 3 minutes, but watch your frittata carefully, you don’t want it to burn! 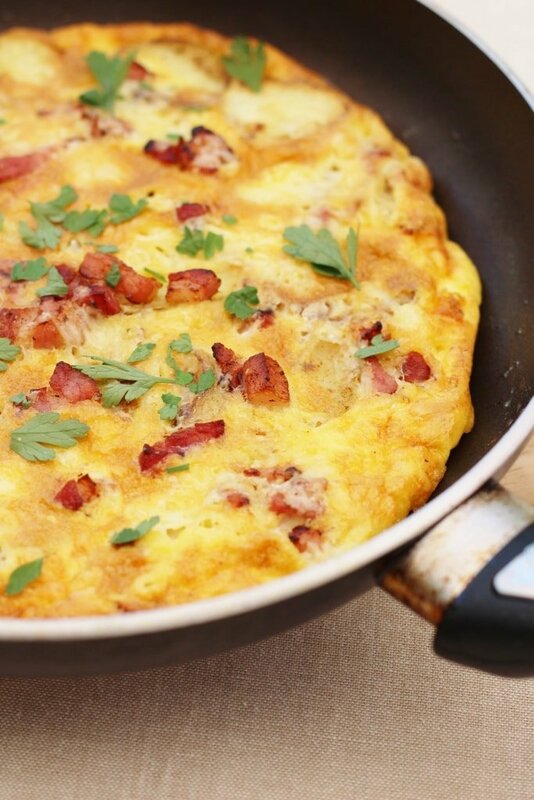 Finally, serve your frittata scattered with parsley and with a side salad…or baked beans! 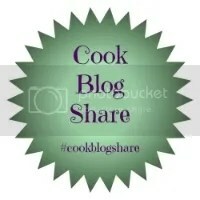 I am linking this up to Cook Blog Share and Brilliant Blog Posts. Aw that’s so cute Eb, definitely a luagh out loud moment when I read your son’s comment. My dad is just the same and rarely comes out with such things – for him it’s often a nod of the head in appreciation as he eats whatever I’ve shared with him and my mum! You know I didn’t realise that purists consider a quiche lorraine should just contain lardons amonst the egg mixture – to be honest had I not been a vegi I’m sure I’d prefer it with new potatoes and cheese as you’ve done here Eb. I’ll have to check out the quorn lardons when I’m next in the supermarket and make a fritatta, we’ve not had one for ages! This sounds lovely Eb, I love quiche but often can’t be bothered with the pastry (plus all that pastry isn’t the healthiest), this sounds like a great alternative. My boys love the M&S cafe too, the call it the Pizza Place (as they like the children’s mini pizzas). Fortunately I got Daniel’s new uniform in the middle of last term as his was starting to get too small so I’ve not had to face the rush over the past few weeks. 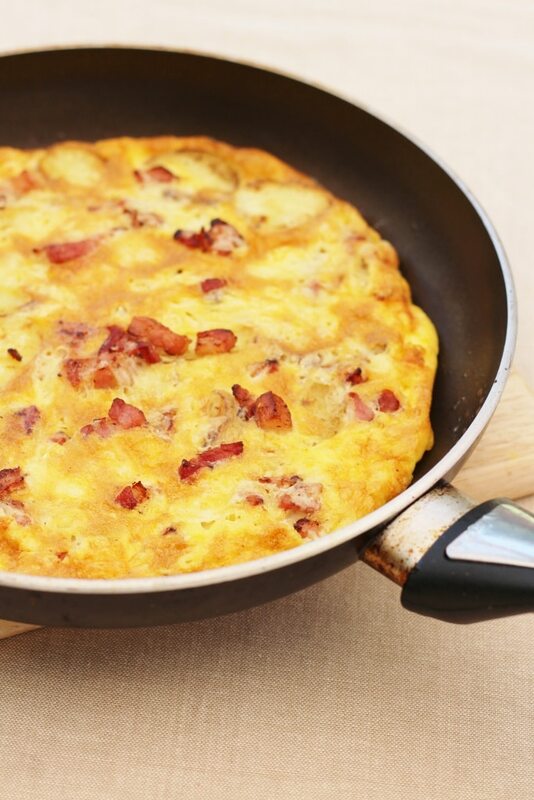 Can’t beat a good Frittata! Tasty, protein-filled and satisfying! I’m really lucky that Miss GF likes quiches and other eggy stuff (mostly). This looks delicious!